Come to visit our shops in the south of the Landes. Shop open all year round. Come to visit us at Geaune with tasting and direct-sale! You will find all our Tursan wines available in bottle or Bag In Box (with a capacity of 3,5 or liters). Other local products are in sales (Floc, Armagnac…). Come to visit us at Mugron with tasting and direct-sale! You will find all our Tursan wines available in bottle or Bag In Box (with a capacity of 3,5 or liters). Other local products are in sales (Floc, Armagnac…). Come to visit us at Messanges with tasting and direct-sale! 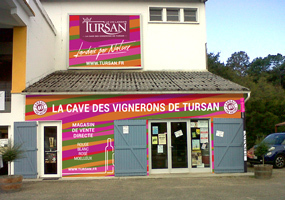 You will find all our Tursan wines available in bottle or Bag In Box (with a capacity of 3,5 or liters). 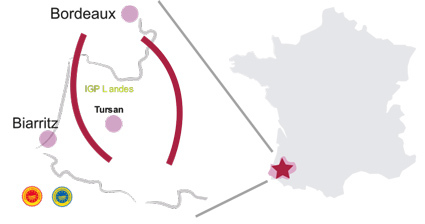 Also you would discover wine of sands, Gérard will reveal the secret of our wines, our terroir, our gastronomy, our culture and the sweetness of the life in the Landes. Come to visit us at Pouillon with tasting and direct-sale! You will find all our Tursan wines available in bottle or Bag In Box (with a capacity of 3,5 or liters). Other local products are in sales (Floc, Armagnac…).